The Fayette County Honor Guard presented arms and a 21-gun salute for the lives lost. Following the prayer Ed Helt sang “We are America” for the crowd. Tim Downing with the Washington Fire Department asked the community to keep those who serve or have served in their prayers to close out the ceremony Tuesday. 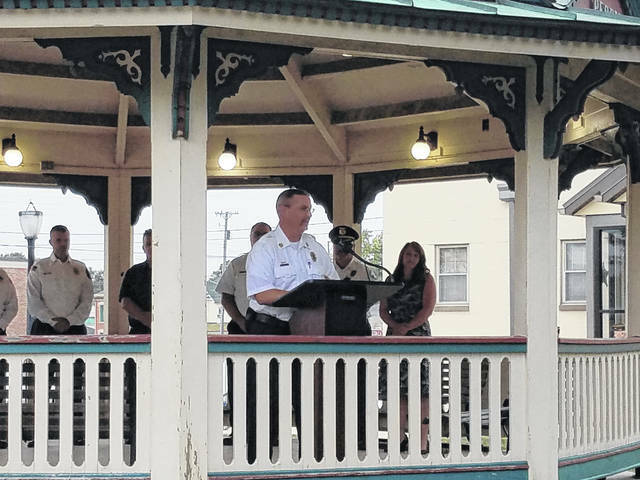 Fayette County first responders, leaders and guests gathered at the gazebo on the courthouse lawn on Tuesday to remember the lives lost during the Sept. 11, 2001 terrorist attacks. Joe Denen spoke for the majority of the ceremony and gave a brief timeline of events during that fateful day in 2001. 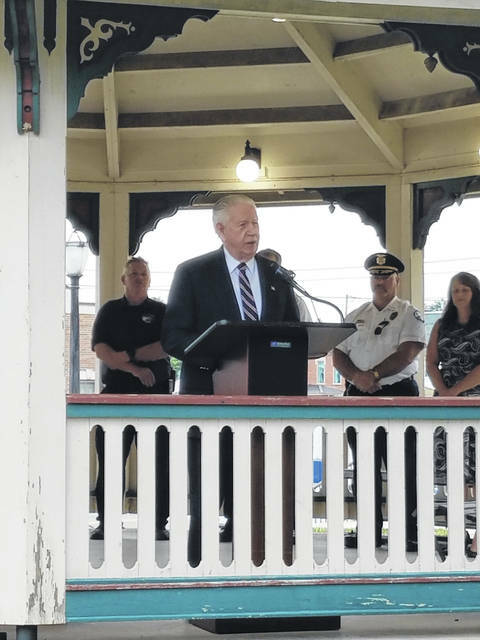 City and county first responders, leaders and guests gathered at the gazebo on the courthouse lawn in Washington Court House Tuesday to remember the tragic events of Sept. 11, 2001. The remembrance ceremony started a few minutes after 9 a.m. on Tuesday with Washington C.H. City Manager Joe Denen welcoming the crowd. Before noon, America would watch as both towers collapsed, another hijacked plane would strike the Pentagon and one more flight would crash in a field in Pennsylvania killing all crew members and passengers on board. In total 2,977 people would be killed in New York City, Washington D.C. and Pennsylvania during the terrorist attacks, with various first responders perishing as they helped to contain the chaos of the attack. Youth pastor at Heritage Memorial Church, Jon Truex, was invited to say a prayer during the ceremony Tuesday. In his prayer he asked for continued healing, protection for the first responders as they continue to protect the community, and comfort for them to know that the community is appreciative of their efforts to help its citizens. Following the prayer, Ed Helt sang “We are America,” and the Fayette County Honor Guard presented arms and a 21-gun salute for the lives lost during the attack. Finally, Tim Downing with the Washington Fire Department thanked the crowd for coming to the ceremony and asked they keep all of those who served or are serving in their prayers. 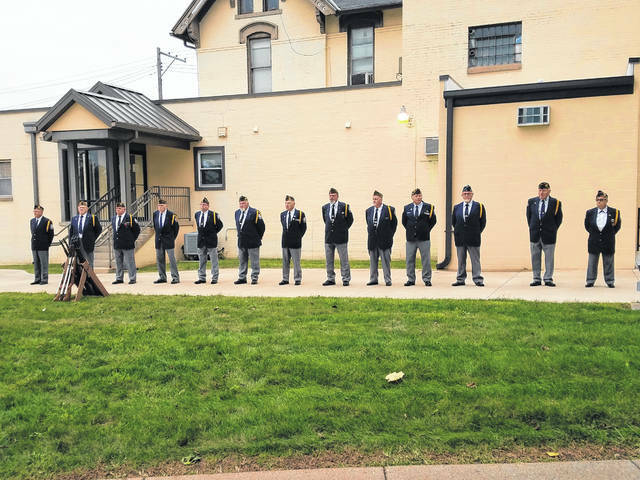 https://www.recordherald.com/wp-content/uploads/sites/27/2018/09/web1_20180911_090102.jpgThe Fayette County Honor Guard presented arms and a 21-gun salute for the lives lost. https://www.recordherald.com/wp-content/uploads/sites/27/2018/09/web1_20180911_091222.jpgFollowing the prayer Ed Helt sang “We are America” for the crowd. https://www.recordherald.com/wp-content/uploads/sites/27/2018/09/web1_20180911_091751.jpgTim Downing with the Washington Fire Department asked the community to keep those who serve or have served in their prayers to close out the ceremony Tuesday. 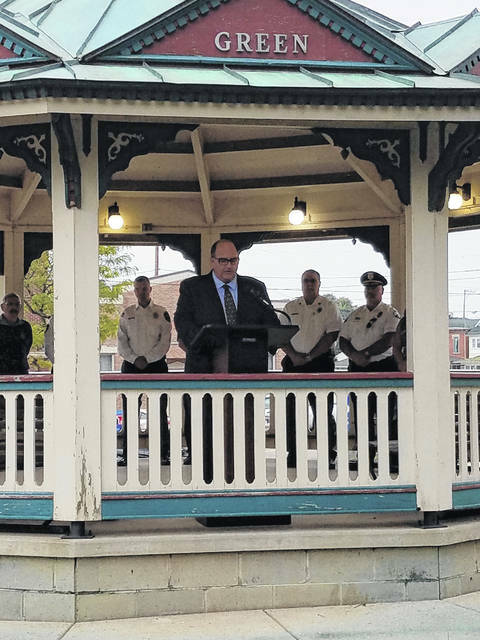 https://www.recordherald.com/wp-content/uploads/sites/27/2018/09/web1_20180911_090440.jpgFayette County first responders, leaders and guests gathered at the gazebo on the courthouse lawn on Tuesday to remember the lives lost during the Sept. 11, 2001 terrorist attacks. Joe Denen spoke for the majority of the ceremony and gave a brief timeline of events during that fateful day in 2001.